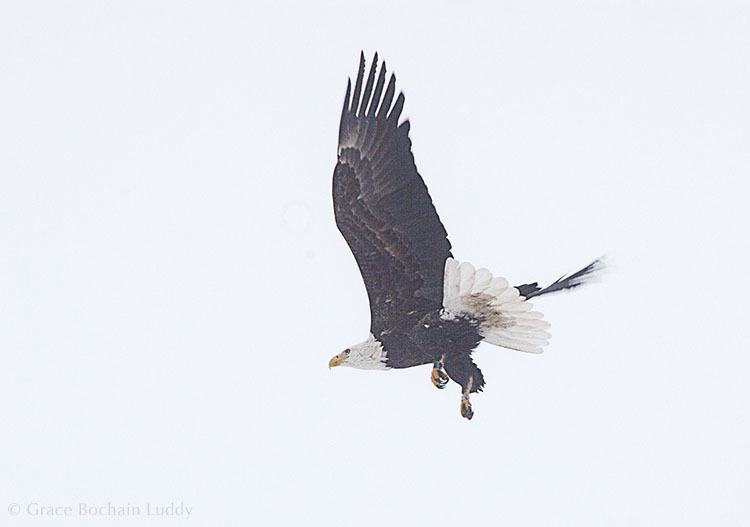 Bald Eagle in flight at the fish hatchery. On the way into the fish hatchery. 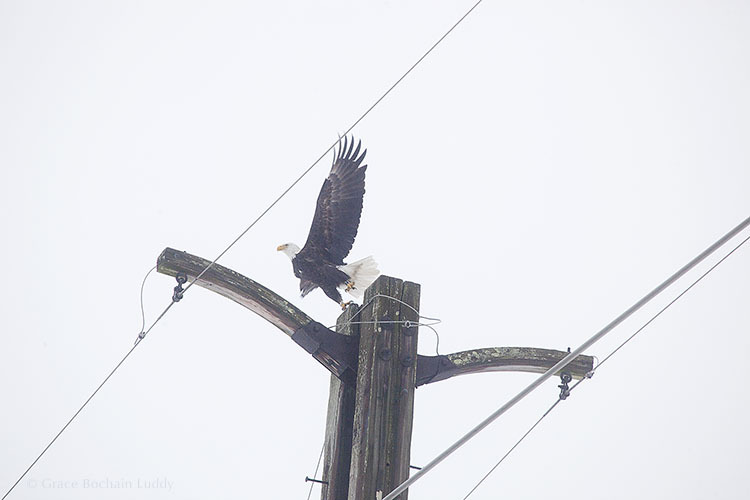 The eagles love to perch on the high electrical poles. I came off the island to celebrate my mother and my sister’s birthdays, but the first thing I did was go to the Fish Hatchery in Central Village, CT. I was hoping to see a snowy owl. Instead, I saw an eagle. Then my sister, her family, and some friends visited Horizon Wings in Ashford, CT. (This is non-profit organization that is a refuge for raptors. It was formed in 2001 by Mary-Beth Kaeser and her husband, Alan Nordell.) Many birds at the center are rehabilitated and released into the wild. Those are protected from human contact. Sometimes this is not possible because of imprinting or injury. Those are kept at the refuge for the rest of their lives. Some are patiently trained to participate in educational programs. Care for the birds is expensive. They need daily attention. They are given mice or other small animals - killed ahead of time because injured birds in a small enclosure cannot quickly dispatch their prey. Birds need species-specific housing. Some need a source of heat. An eagle can see a mouse from a mile away. It can also see fish underwater. It has a six-foot wingspan but only weighs twelve pounds. A three-pound hawk can carry off a squirrel that weighs six pounds. An owl has twice as many vertebrae in its neck as we do, which allow it to turn its head 270 degrees. Birds use their wings as a “cape”. A bird with a missing wing is like a person with half a coat. It cannot stay warm. For this and perhaps for other reasons, it is now illegal to operate on a wild bird with a missing wing, even if the operation would save its life. I knew owls were silent, but I didn’t know why. They have special feathery edges at the end of their wings… special silent edges. And their wings have a narrow range of motion. They are made to provide lift without beating fast. The fastest bird and in fact, the fastest animal of any kind, is the Peregrine Falcon. It flies high, spots prey and dives backward, plummeting with an average diving speed of 112 miles (and a maximum of 242 miles) an hour. The falcon has special baffles in its beak to keep air from driving in and damaging its lungs. This is a two-year old Bald Eagle. In a year or so, he’ll have his characteristic white head. His brown eyes will turn the color of cream and eventually to gold. 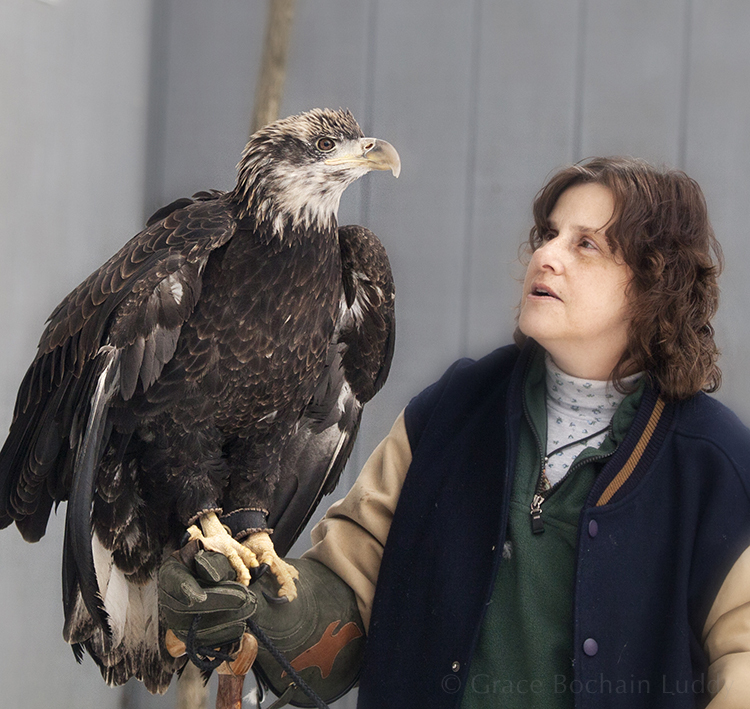 Mary-Beth and Alan were able to bring this eagle from Washington State after much wrangling and paperwork. He will never be returned to the wild because of an injured wing. Mary-Beth is training him. I try to imagine how counter-instinctive this must be for the eagle…I think he’d just as soon be abducted by aliens. Some handlers withhold food to force a wild animal to come to them but Mary-Beth won’t do that. She makes slower and more sustaining progress through daily contact… and also by singing …letting him hear her constantly… giving him an ongoing thread to associate with care and food and safety. Mary-Beth is holding him in this picture and singing the song she always sings… “You Are My Sunshine.” After two years, and just a week or so ago, he looked directly into her eyes for the first time, then inclined his head toward her and returned a low call. This American Crow was attacked by a hawk when he was a chick. The hawk actually had him in his talons. Other crows came and harassed the hawk until he dropped the chick, whose shoulder was broken. This fellow will take things he is given, shiny objects like dimes, and save them in his treasure box. He is given extra food each day because wild crows come and he feeds them through the spaces in the netting around his cage. 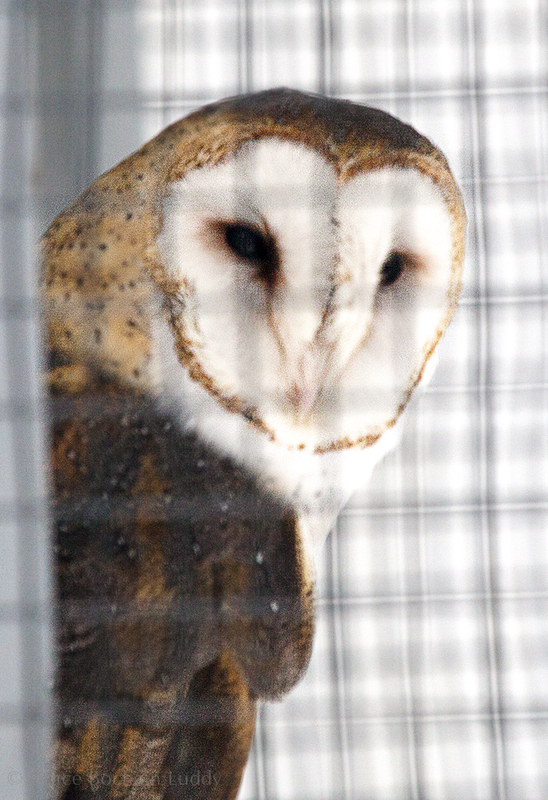 This Barn Owl was born in captivity. She was raised as an educational bird and brought to Horizon Wings when the non-profit portion of her facility was closed. This is a little Northern Saw-whet Owl. She was stunned after being slightly grazed by one car, and the driver went back to pick her up. But in the meantime another car came, and that’s when she was severely injured. She was so light she was blown around underneath the car as it passed. Her eyes were abraded on the road and she suffered neurological injuries. This is the same tree as you saw earlier in the blog... except it's in the evening. I wanted you to see the night coming. We can't see in the dark, but owls can, and even Wilson and Molly can. At least in Central Village... night is still wild and it belongs to them. I went back to the Hatchery the next evening. Someone started doing target practice somewhere across the river. The sounds of gunshots came every two seconds, and then there was a break and then many more shots in rapid succession. This continued for some time. I saw the eagles but they were up and circling, very high, probably where they felt as safe as possible. Wilson (my older golden retriever), starting shaking. 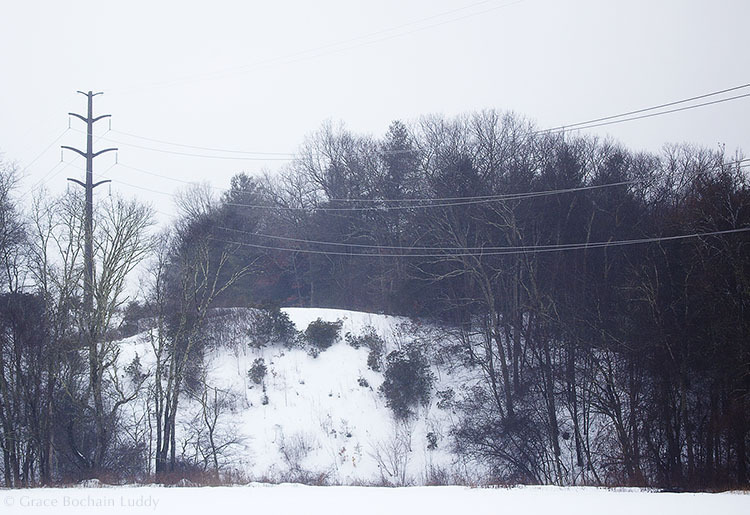 We made our way back to the car through snow, stepping in deep footprints I had made on my visit a few days before. Wilson stopped every five seconds to sit on my feet, to feel the comfort of my legs against his back, but he also blocked my progress. On instinct, I began saying…”Good Wilson… good Wilson… it’s OK, Wilson… good boy…” in a soft sing-song voice. Then I remembered Mary-Beth singing to her eagle. I have learned by taking pictures of animals that I live beside them in a different universe. Me and birds or… dragonflies, or bees or seals or deer or others… all of us …in the same landscape… usually unaware of each others' presence, and basically oblivious to each others' experience. It fascinates me, with all our differences, that is it is possible to bridge the gulf at all. I have been told that I project human interpretations on animal behaviors. OK, well, that’s absolutely true. (Once when I was by myself on the island I passed an enjoyable evening with a fly. I gave him a little red wine, which did not improve his flying.) But still, I think we are the same in certain ways. We all know what fear is, and food, and trust, and safety (and light for that matter as you know, but that’s another topic). This common knowledge can help us make a connection if we want to. Or need to. I asked myself why people whose children are grown would tie themselves up with such a constant expense and responsibility. I can only say what is obvious when you meet them. They do it because they love the birds. These birds are a remnant, luckily saved among thousands… They uniquely live between their world and ours. Perhaps they show us something. I feel like I made the smallest start in such a short visit. I love their golden or amber or their night black eyes. I love their beauty and power. I love their variety and adaptation… the incredible way that they are so suited, so especially and perfectly suited to the requirements of their lives. It’s all of that, but that’s not all. There’s something I feel so strongly but have no words to describe. I’ve gone back to the pictures again and again, which is the big advantage of pictures. I think of how the birds are caged but also protected. I think of all the other birds out there, their ranges expanding and contracting, the life and death in every encounter, how any one of them is a few days at most, from starvation. I remember that many of the birds in the refuge are endangered or on a watch list. I think of the wild crows coming and wonder why the caged one gives them food. I think of the eagle slowly acclimating to Mary-Beth and finally returning her song. I don’t want to make this into a romantic story. I know that any one of these birds would eat me for lunch if it could. I’ll say again that I have no words for what I feel when I see them. I can only say they affect me and I can see something deep and significant in their magnificent lives. I see our habitat merging with theirs…Falcons in New York City, Eagles at the Fish Hatchery, Snowy Owls on Block Island… and I hope it continues. I will joyfully go out and take their pictures. I’m glad that two people have decided to take care of them and tell other people about them. Horizon Wings has a clean up day once a year and the public is invited to help. They also need and accept tax-deductible donations. More information is available here (http://www.horizonwings.org/). This is the Bald Eagle flying on the first day.